Birthday Parties | Malik The Magic Guy! Top New England Comedy Magician Boston Massachusetts and New England Magician Malik the Magic Guy. Malik has been performing birthday parties for so long, that his mother used to drive him to shows because he was too young! 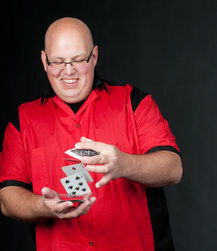 Your child's next birthday party can be extra special with the addition of Malik's magic show. The show features age appropriate visual magic, juggling, comedy, and tons of audience participation. The birthday child becomes the star of the show by participating in the grand finale. Malik is amazing! He was easy to communicate with, very friendly, and very professional. Not only is he a talented magician but he’s also hilarious! We hired him for our son’s 11th birthday party and he involved all of the children with his tricks and had everyone laughing, even the adults. Especially the adults! He customized his show for my son, who is mature for his age, so the kids never felt like they were being played down to which was so cool. I love that he took the time to learn who he was going to be working for. He’s a true talent and I’m so, so happy that I found him! Hire this man!! Wow! What an awesome show. The kids and adults had so much fun. All I heard was that this was the best party anyone had been too. Malik I can't thank you enough katelyn loved it. Malik was extremely entertaining for both kids and adults. He kept the crowd engaged, amazed and laughing the entire time he was performing. He was very easy to work with, arrived promptly and was extremely professional. I would highly recommend Malik.